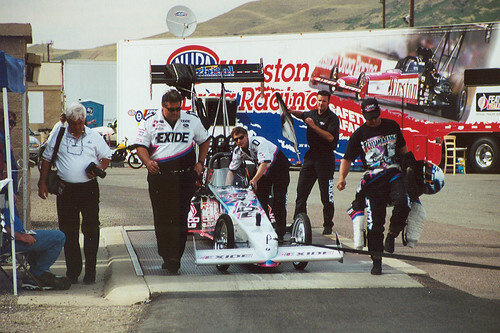 Tony Schumacher’s Top Fuel dragster on the scales after a qualifying run at Denver’s Bandimere Speedway at the 2000 NHRA Mopar Parts Mile-High Nationals. This is the same car that he drove to the sport’s first 330 mile per hour run in Phoenix on 28 Feb 1999. That’s Tony at far right holding his helmet. I think this was his last season with Exide as chief sponsor before the U.S. Army became his sponsor.